Yes, I recognize the irony that you probably found your way to this post by way of Google. Nevertheless, I'm not dispensing medical advice; merely logic. 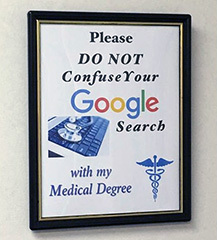 I see more and more signs in doctors' offices that remind us that Google is not a doctor. Variations include "Do not confuse your Google search with my medical degree." While Google can be useful as a search tool, the doctors have a serious point, because most searchers not only do not limit themselves to reputable sources of information; they have no skill in determining what actually comprises a "reputable source". One case is the efficacy of vaccines. Although scientific studies have found no causal link between vaccines and autism, thousands of people avoid vaccines through fear-mongering induced by celebrity endorsements bolstered by flawed and debunked studies that have gained a sort of zombie life through constant repetition. And because of this, some diseases that had been eradicated in the United States have made a comeback due to the vaccine avoidance combined with the re-introduction of these diseases via immigration from less developed nations where the disease still exists. Had more people been properly vaccinated, the disease would not resurge. It doesn't help that humans aren't very good at assessing risk. Despite all evidence, fearmongering has lead many people to conclude that they'd rather face the risk of death than that of autism. And this is despite the "left hand not knowing what the right hand is doing" situation of others declaring that "autism is a difference, not a disability" Comparing risks, anti-vaxxers would prefer a known cause of death to an unproven cause of "difference". This is simply not rational. Rather than listening to others within their limited "bubble", the anti-vaxxers should defer to medical opinion. But in Google searches, the anti-vaxxer will find plenty of confirmation for their bias. Disinformation is in the top responses because, generally speaking, on social platforms the people who seek out such topics are searching using terms that skew the results and return an inordinate amount of social media rather than professional opinions. On those social media platforms, through confirmation bias, they upvote the responses that makes them feel better about their own opinions. Google will almost always tell us what we want to hear, because SOMEWHERE in the noise and babble of seven billion voices, you will find others who will tell you exactly what you want to hear. Whether it's about climate change, the reality of the Moon landing, or the roundness of the Earth, you will find loud and aggressively worded defenses of all sides of any topic. Some of them are objectively correct, some aren't; and much of the time you are not qualified to determine which is which. Suppose you're looking at a case study: a 32 year old Caucasian cis-gendered male, with no physical diseases or abnormalities. Nonetheless, this person declares that he is "a paraplegic trapped in a healthy body". He refuses to walk on his healthy legs, though they cause him no physical pain. He uses a wheelchair, and insists on living the lifestyle of a paraplegic. 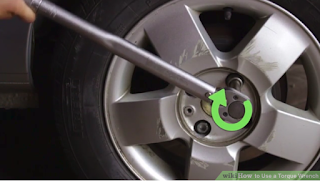 He has gone so far as to modify his automobile with hand controls. In every respect, he seems quite sincere. 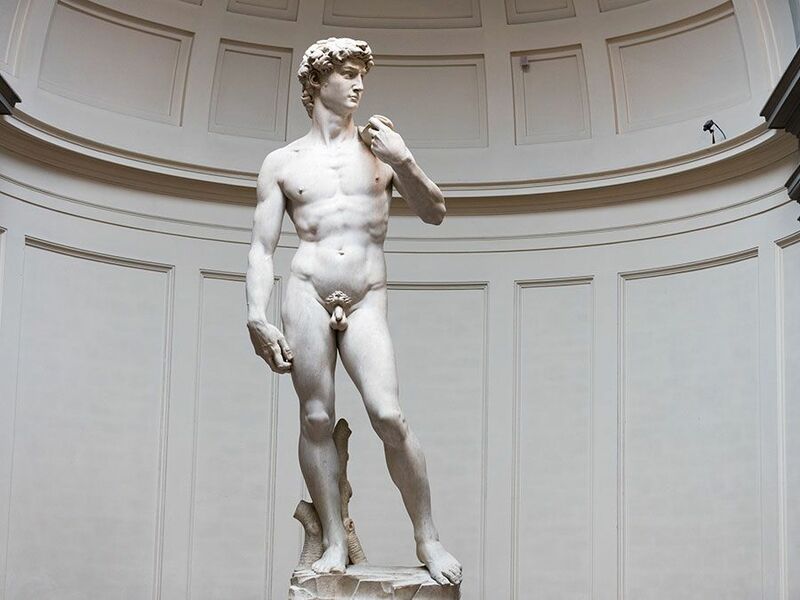 He then visits a surgeon to have his healthy limbs removed so that his outward appearance will validate his self-image. This is a strong hypothetical, as it's not hard to confirm that such persons do, in fact, exist. It would be difficult to find a surgeon who would not conclude that the patient has a form of somatic dissociation or somatic delusion and refer him for psychological treatment. "Doctors know there’s no such thing as genetic anatomy or any number of other made up terms like 'normal limb development'. A person’s Hox genes code for the development of the fetus, and account for variations of limb development. "During fetal development these genes determine the production of retinoic acid and FGF hormones and those determine what happens next. "The phenotype, the actual expression of the genetic code into a real body happens in the influence of those chemicals. The result depends on not only which chemicals are being produced but whether the receptors are properly formed. At the end you end up with a baby with fully formed or truncated limbs. The rest of the body of an infant doesn’t much care. "Further when we artificially remove the limbs of a person we really are changing the way their entire body is interacting as if they had been born without limbs. "Doctors know that when the two things, the phenotype and identity, don’t agree that they have a surgical candidate. What did you think the answer would be? That’s the answer for nearly every doctor, and the professional organizations like the AMA, APA and AAFP. It is what is taught in medical school. It is well supported by research and it is well documented by the presence of real life people like me." However, "Saying it don't make it so." Again, the disinformation is a top response because, generally speaking, on social platforms the people who seek out such topics are those that have the disorder, and through confirmation bias, upvote the response that makes them feel better about themselves. The response may look legit, because the responder has included enough jargon to sound scientific without being obscure. Of course, there are logical fallacies in the response, but these are easily missed by those who aren't looking for them. Other people may therefore take it at face value, concluding erroneously both that the person who is best qualified to opine on a condition is always the person who has it; and that the person responding is doing so truthfully, without bias. Of course, the response is hogwash. Doctors know that normal limb development is not a "made up term" and that there are distinct differences between people who are born without limbs and those whose bodies are artificially altered. They know that someone with a somatic delusion is delusional. They treat the statements of the patient skeptically, as data rather than as knowledge, because they know that the response of the patient is likely to be biased in favor of "normality". Few people want to be "abnormal"... not even Napoleon Bonaparte in a roomful of Bonapartes. And many patients are simply incapable of accurate self-assessment. Yet, while professional ethics should demand that the surgeon assess the patient scientifically and objectively, you will still find surgeons willing to amputate the patient's perfectly normal limbs. Rather than looking at the bulk of the literature, the Google searcher may cherry-pick these outliers as "proof" that the "medical establishment" sees this somatic dissociation as a normal condition best addressed by body modification. The patient will dismiss science and preferentially select opinions from others within their own "bubble". But you don't have to go to extreme case studies to recognize that laypersons are often simply wrong. They haven't studied (hence "laypersons") and repeat what they have heard or what they suppose as fact. And unlike in this blog, where I insist that everything is an expressed opinion that you should verify, they fail to label their statements as opinion. Hence, it's important that you learn the difference between reputable and non-reputable sources. The effective practice of medicine is not done through public consensus, but through science. 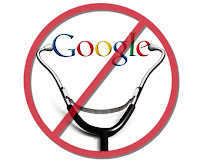 Google is NOT a doctor.